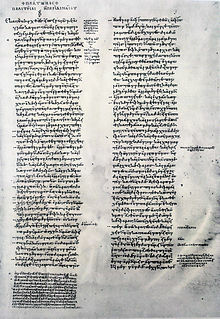 The Republic (Greek: Πολιτεία, Politeia; Latin: De Re Publica) is a Socratic dialogue, written bi Plato aroond 380 BC, concernin the defineetion o juistice (δικαιοσύνη), the order an character o the juist ceety-state an the juist man—for this raison, auncient readers uised the name On Juistice as an alternative teetle (nae tae be confused wi the spurious dialogue an aa teetled On Juistice). ↑ Henri Estienne (ed. ), Platonis opera quae extant omnia, Vol. 2, 1578, p. 327. ↑ Brickhouse, Thomas and Smith, Nicholas D. Plato (c. 427–347 BC), The Internet Encyclopedia of Philosophy, University of Tennessee, cf. Dating Plato's Dialogues. ↑ Lorenz, Hendrik (22 April 2009). "Ancient Theories of Soul". Stanford Encyclopedia of Philosophy. Retrieved 2013-12-10. This page wis last eeditit on 22 Mey 2016, at 21:44.